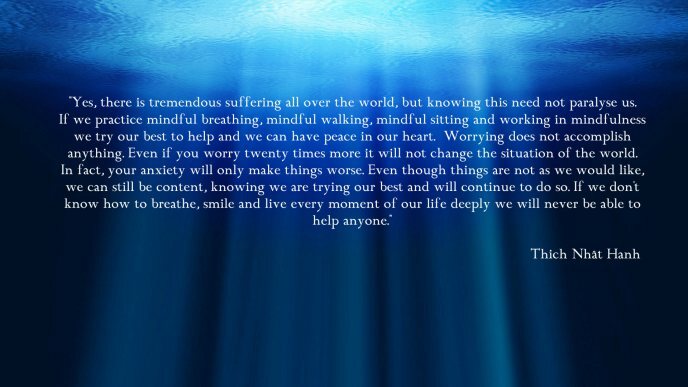 With a deep mindful breath we announce to the world the news that yesterday, the 11th of November 2014 Thay, Zen Master Thich Nhat Hanh, experienced a severe brain hemorrhage. Thay is receiving 24 hour intensive care from specialist doctors, nurses and from his monastic disciples. At present, Thay is still very responsive and shows every indication of being aware of the presence of those around him. He is able to move his feet, hands and eyes. There are signs that a full recovery may be possible. For the last two months, Thay’s health had already been fragile due to his advanced age. He was hospitalized in Bordeaux on the 1st of November. He was gaining strength day by day until this sudden and unexpected change in his condition. All the monasteries in the tradition of Plum Village are organizing practice sessions to generate the energy of mindfulness and to send Thay this healing and loving energy. We would like to ask the whole worldwide community of meditation practitioners to participate and support us in this critical moment. We know and trust that Thay will receive all your energy and that this will be a big support in his healing and recovery. Our practice of stability and peace in this very moment is the best support we can offer to Thay. Let us all around the world take refuge in our practice, going together as a river to offer Thay our powerful collective energy. We are all cells of the great Sangha Body that Thay has manifested in his lifetime. Future reports on Thay health and recovery will be posted officially at www.plumvillage.org, langmai.org, villagedespruniers.org, and http://www.facebook.com/thichnhathanh. Please join us in sending Loving Healing Energy his way.